In the evening hours of Friday, September 16, 1932, a young blonde woman in a blue floral dress and a smart suede coat made her way up a trail in the hills north of Hollywood – up the steep slope to Mt. Lee, where the lights of a now-famous sign flashed. The fifty-foot high letters then read “Hollywoodland” – a cheap gimmick to sell real estate in the hills above Los Angeles. She reached the “H” and located the maintenance ladder on the back side. Ascending the ladder rung by narrow rung, up she climbed toward her destiny, as the lights of Hollywood winked at her from far below. Two days later, the broken body of the pretty young blonde was discovered by a hiker in a ravine below the “H” in the Hollywood sign. Later, the dead girl was identified by her uncle as Peg Entwistle, a young English actress who had recently come to Hollywood to work in talking pictures. She was 24 years old. The HOLLYWOODLAND sign and the Humphrey Bogart house, circa 1925. Bogart was a Beachwood Canyon neighbor of Peg Entwistle, and he had acted with her at Lakewood Theatre in the summer of 1931. Image courtesy Los Angeles Public Library, Security Pacific Collection. What has any of this to do with Lakewood Theatre, 3500 miles away in Madison, Maine, you ask? Just a year before she leapt off the Hollywood sign into eternity, Peg Entwistle had enchanted audiences for two summers at Lakewood Theatre, acting there alongside her neighbor and friend, Humphrey Bogart. The playbill for the Lakewood Theatre play in which Humphrey Bogart played Peg's love interest. But in truth, Peg Entwistle was a much-respected and highly successful Broadway actress who had just broken into the movies. She had been invited to be part of the then-exclusive and prestigious Lakewood Players two summers in a row -- no small accomplishment, as literally dozens of actresses applied to Lakewood each year, and were turned away. Peg had also just completed her very first (very well-received) movie, and, while she had been dropped from the RKO payroll, that occurrence had more to do with Depression economics than with her talent or performance. As a seasoned actress who understood that the profession was "boom or bust," this circumstance alone would not have thrown her into a suicidal state. So why did she jump? Well, Peg's story is a complex one. Like other Broadway actresses in the late 1920s and early ‘30s, Peg wanted to try her luck in the “talkies” – and, unfortunately, she had burned some of her theatrical bridges to take a part in the movie Thirteen Women with RKO. Because she had backed out of some of her stage obligations (including a third summer season at Lakewood), she realized she was blacklisted from the profession she loved and always intended to return to – stage acting on Broadway. Add to that other complicating factors (a failed marriage, strapped finances, and guilt over having put herself and her career ahead of her family, friendships, and professional relationships), and her Hollywood disappointment fades into the background as the least of the reasons she chose to end her life. A picture of Peg in a 1931 playbill, describing her "dashing around Lakewood at top speed" with her beloved dog Robin. Peg Entwistle’s story is a complicated one, full of grit and glamour, triumph and tragedy. And for two seasons and 17 productions, Lakewood Theatre was part of her story – so much so that long-time Lakewood Player and summer resident, the famous actor Arthur Byron, attended her funeral in Hollywood, perhaps as a representative of the Lakewood Theatre Colony. 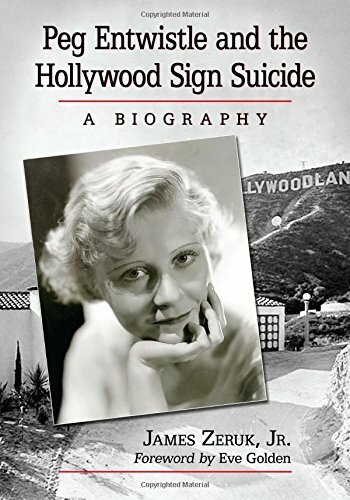 For a definitive biography of Peg Entwistle (including details of her time at Lakewood Theatre), I recommend the biography by James Zeruk, Jr., entitled Peg Entwistle and the Hollywood Sign Suicide. Zeruk’s research is extensive; he goes into great detail in dispelling the persistent myths regarding the causes of her suicide and unveiling the truth of Peg’s life. For the sections on Peg’s connection with Lakewood Theatre, Zeruk even contacted Jeffrey Quinn for copies of old playbills to be sure the section on Lakewood is accurate. Peg’s story is fascinating and heartbreaking, full of ironies and mysteries, and Zeruk’s treatment of her life is at once compassionate and probing – well worth your time.